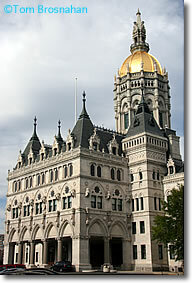 Connecticut's state capitol stands on a hill in the center of Hartford, its gold dome easily visible to anyone driving through on an Interstate highway. Richard M Upjohn is the architect responsible for the Connecticut State Capitol, a great potpourri of architectural styles and periods, including Gothic niches housing soldiers in Civil War uniforms. For all its eclecticism, the Capitol is fine to look at. At one time it was topped by a statue of The Genius of Connecticut, a lady. You can see that statue inside the building, and also the battle flags and memorabilia preserved here. Across Capitol Avenue is the State Library and Supreme Court, a pretty building housing the paper treasures of Connecticut history, including the famous royal charter once hidden in an oak tree. Besides preserving the documents, the library is now the repository of the Samuel Colt collection of more than 1,000 firearms. All together, the collections here make up the Museum of Connecticut History. Near the Capitol and State Library, in Lafayette Square, is The Bushnell, a hall where many of the city's concerts, plays, and recitals are held. The interior is of the purest 1930s art deco, a style which has seen a resurgence in recent years. The Vienna Boys Choir or the Boston Symphony—you may find either on the playbill here. Connecticut's state capitol, an eclectic work, to say the least.